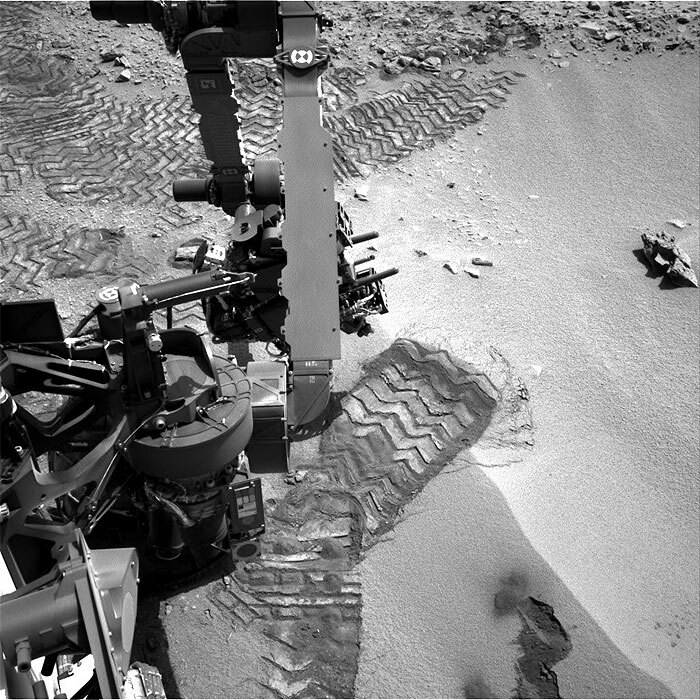 On the preceding sol, the rover completed its third round of using vibration of scooped Martian soil to scrub the interior surfaces of the sample-processing mechanisms on the rover's arm. Also on Sol 81, the rover's Sample Analysis at Mars (SAM) instrument completed an analysis of a sample of Martian atmosphere. 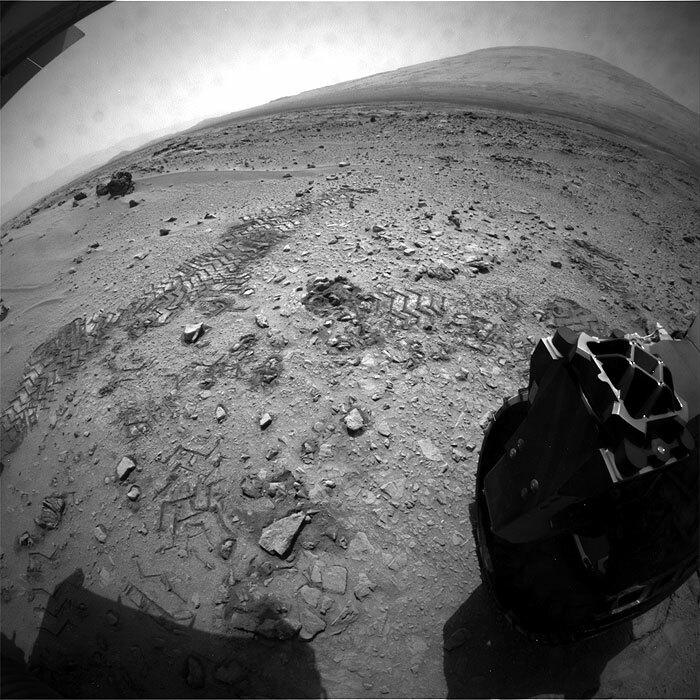 The rover continues regular monitoring of the surrounding environment using the other instruments of its science payload. 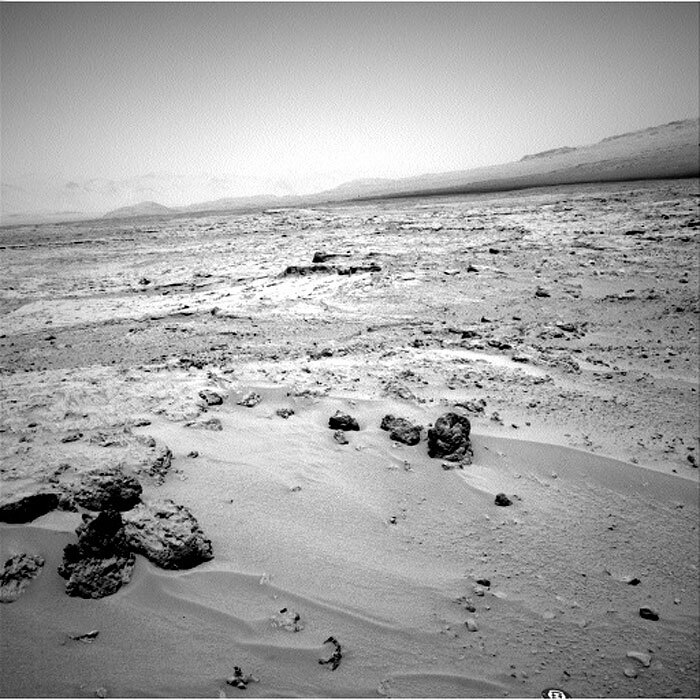 Sol 82, in Mars local mean solar time at Gale Crater, ended at 1:35 p.m. Oct. 29, PDT (4:35 p.m., EDT). The rock's informal name comes from the name of an island in Great Slave Lake, Northwest Territories, Canada. 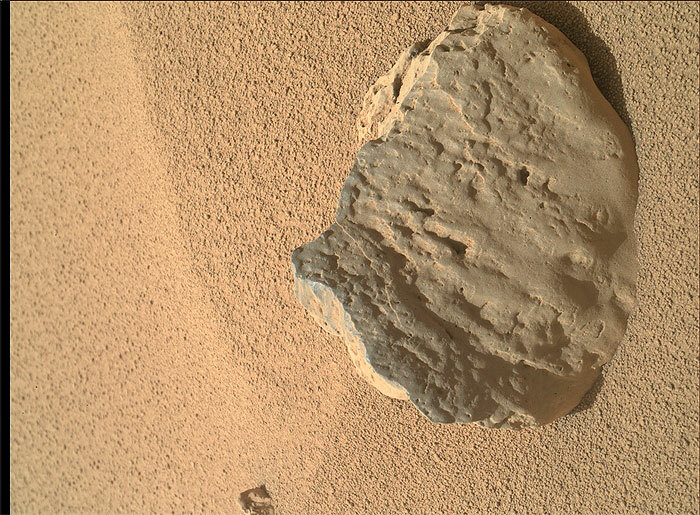 MAHLI viewed the rock from a distance of about 15.8 inches (40 centimeters). The image covers an area about 9.5 inches by 7 inches (24 centimeters by 18 centimeters). 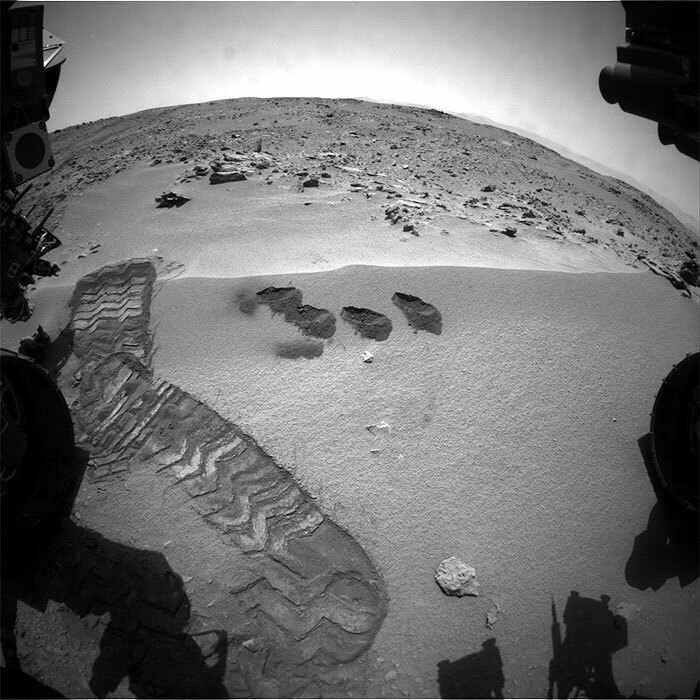 Et-Then is located near the rover's front left wheel, where the rover has been stationed while scooping soil at the site called "Rocknest." 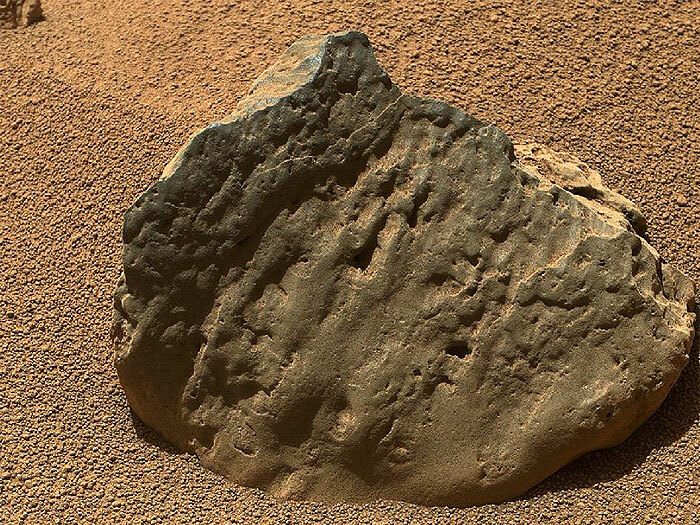 This is one of three images acquired by MAHLI from slightly different positions so that a three-dimensional information could be used to plan possible future examination of the rock. 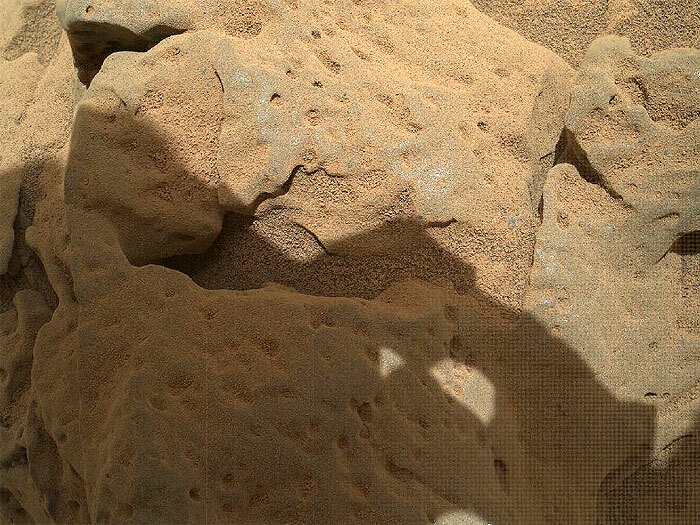 This image was taken by Mars Hand Lens Imager (MAHLI) onboard NASA's Mars rover Curiosity on Sol 82 (2012-10-29 08:48:07 UTC) . 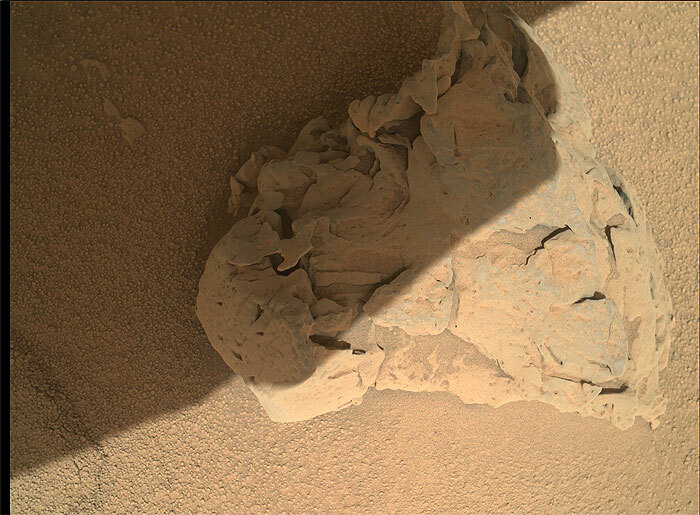 This image was taken by Mars Hand Lens Imager (MAHLI) onboard NASA's Mars rover Curiosity on Sol 82 (2012-10-29 09:02:00 UTC) . This image was taken by Navcam: Right A (NAV_RIGHT_A) onboard NASA's Mars rover Curiosity on Sol 82 (2012-10-29 09:10:08 UTC) . 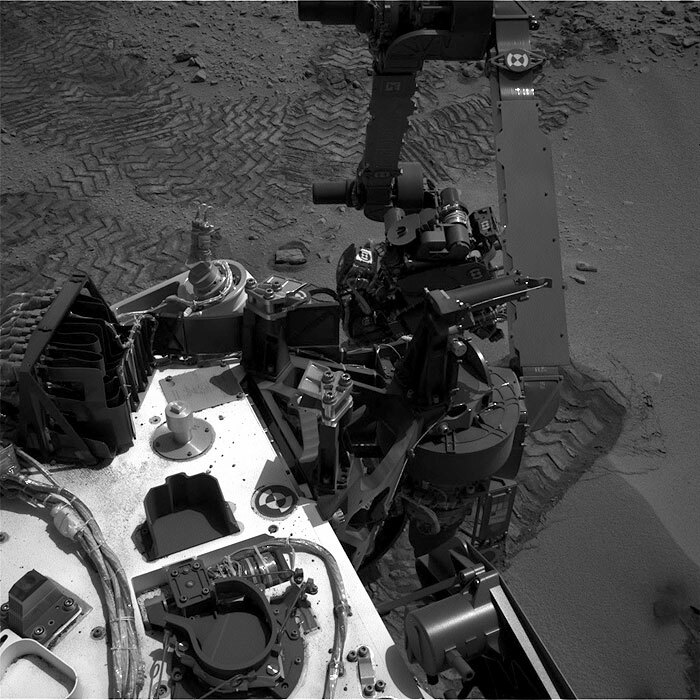 This image was taken by Navcam: Left A (NAV_LEFT_A) onboard NASA's Mars rover Curiosity on Sol 82 (2012-10-29 09:10:08 UTC) . This image was taken by Rear Hazcam: Right A (RHAZ_RIGHT_A) onboard NASA's Mars rover Curiosity on Sol 82 (2012-10-29 05:30:20 UTC) . This image was taken by Front Hazcam: Left A (FHAZ_LEFT_A) onboard NASA's Mars rover Curiosity on Sol 82 (2012-10-29 09:10:28 UTC) .